For last month’s homework, I had to prepare a relaxation sequence – the sort of thing I’d say out loud during savasana at the end of a yoga class. Here’s what I came up with. Feel free to imagine me saying this aloud in a calm, soothing voice. 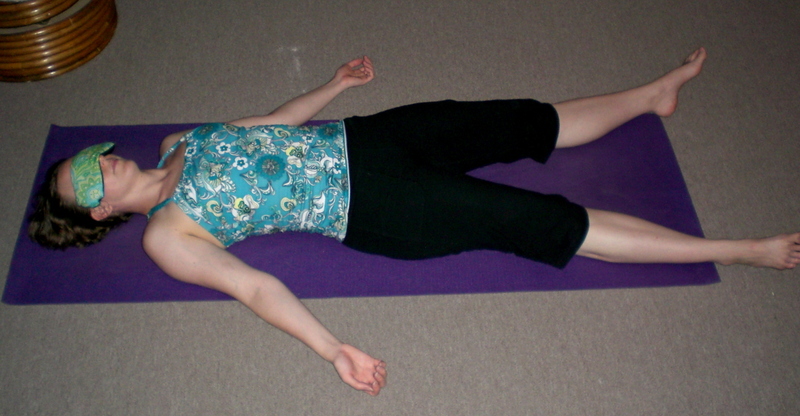 Let’s start getting ready for savasana: do any last pose or twist you need to do, then come down to lie on your mat. Make sure you’re warm enough, arrange your clothing so nothing’s bothering you, and we’ll prepare the body for relaxation. First, flex your feet: curl your toes, really tense the feet… and relax them. Now tense your legs: engage your calf muscles, squeeze your thighs, really tighten… and relax. Tighten your tush, squeeze it hard, really flex… and relax. Now squeeze your belly, tighten your abs, pull it really tight… and relax. Curl your hands into fists, squeeze them hard, flex the arms, tighten the arm muscles, push… and relax. Pull up your shoulders, squeeze them up toward your ears, really press hard… and relax. Now squeeze your face: scrunch up your nose and mouth and forehead, really squeeze… and relax. Release all the tension from your body, and feel your whole body relax. Feel the floor holding you up. Let your body be heavy; let yourself just sink down into the floor and rest. Let your mind rest too: just watch your breath move in and out, in and out. Let all your worries go for just a few minutes and luxuriate here. I’d give the students several minutes to relax in savasana. Then I’d invite them to begin to bring movement back to the body – wiggling fingers and toes – and to roll onto one side, then up to a comfortable seated position. After a moment of meditation, we’d all say “namaste” and the class would be over.